I read five of the eight books I wanted to read last week, and also did not complete a few other goals I had intended on finishing–work was a bit stressful for me. I need to work on better decompression strategies. Do you have any? I’m featuring mostly Overdrive books in my graphic this week. It Happens in the Hamptons, California, My (Not So) Perfect Life and the Court of Mist and Fury are all under that category. I picked up California because I loved Woman No 17 by the same author so much… The Friends with Partial Benefits was free on Kindle and The Assistants was under $2 a while back on Kindle. Yay! I’ve been spending a lot of time in the planning communities, I’ve been ADDICTED to getting stickers and boxes in my planner. I think it could be a lot of fun, I’ve always been a fan of stickers, but actually putting full, multiple lined blocks in my planner hasn’t felt natural until now. I will DEFINITELY be sharing more of the planner. It helps keep me motivated AND helps keep me on task (mostly). On Wednesday, Armchair BEA will be startingArmchair BEA will be starting. I am SO EXCITED for that. Look for My Intro later this week. I’ve been doing a lot of menu planning lately. Apart from my copycat spaghetti sauce recipe, some hits have been our Sirloin Griller (with PINEAPPLE!) and ground turkey taco salads (nearly sinless because we don’t use shells or chips and we don’t use any salty/preservative-laden seasoning). Simple stuff has been winning me over lately. And it’s a little more cost effective than going out all the time. I spent some time last week finishing Riverdale (which was all sorts of WOW!!! ), and I really don’t want to wait until the end of this year for the second season of the show. I want to rewatch Twin Peaks before I get the chance to watch the new show. Fargo is also really awesome in the third season. I cannot believe how riveted I am to it. I’ve been doing some letter writing, which isn’t as awesome as book-writing, but it’s little steps. I want to try and get more of my to do list down first. We’ve also spent some time playing games, which is an excellent de-stressor. I hope to share one of our favorites with you soon. 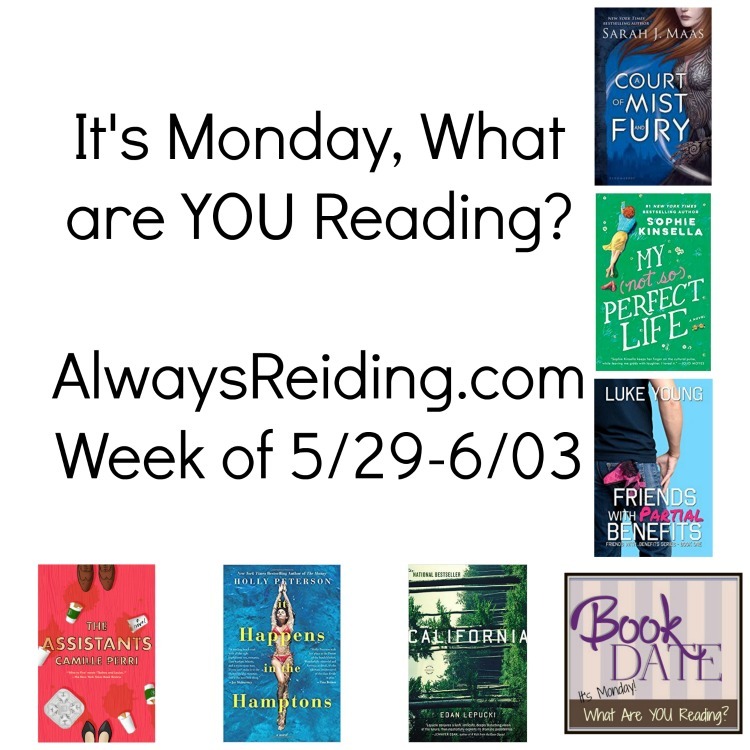 But getting back to it, It’s Monday, What are YOU Reading? The cooking sounds very tasty! Nice to avoid all the preservatives. Hope you enjoy Armchair BEA, it is fun, I took part one year but on the whole prefer to spend whatever time I have to spare reading! I love getting free Kindle books too. The problem is I usually put those on the back burner because I have no due date to read them, like I do with library books. ha. But they’ll be there when I get ready for them. The favorite book I’m reading now is Small Great Things, which is a library book and I know I won’t be able to renew it so I need to finish it within 2 weeks.